Your 401(k) is the ultimate savings vehicle, it’s an investment portfolio, a place where you save and invest money throughout your working career. So in the future you can retire, be financially secure, and achieve financial independence. But, what happens to the money in the retirement account with your previous employer when you change jobs? Should you leave the funds in there? Should you do a 401(k) or IRA rollover? Will you be charged any fees? Here, I’ll answer your questions and go over the options available to you so you’re able to make the best informed decision possible. You can rest assured that your money is safe and the savings you’ve accumulated in that retirement account is yours regardless. But, you’ll need to a decision as to what you’ll want to do with the money in that account. Below I’ll go over the most common options and choices you have regarding your old 401(k) account. 1. Leave the money in your old 401(k) account. A few employer 401(k) accounts have certain terms and conditions that must be followed, like minimum balance requirements you need to meet. If you don’t meet these specific terms, you may be charged a fee or possibly be required to move the money, but we’ll go more into that later below. In most scenarios, it’s absolutely fine if you leave the money where it is and don’t touch it. 2. Transfer the funds to a new 401(k). 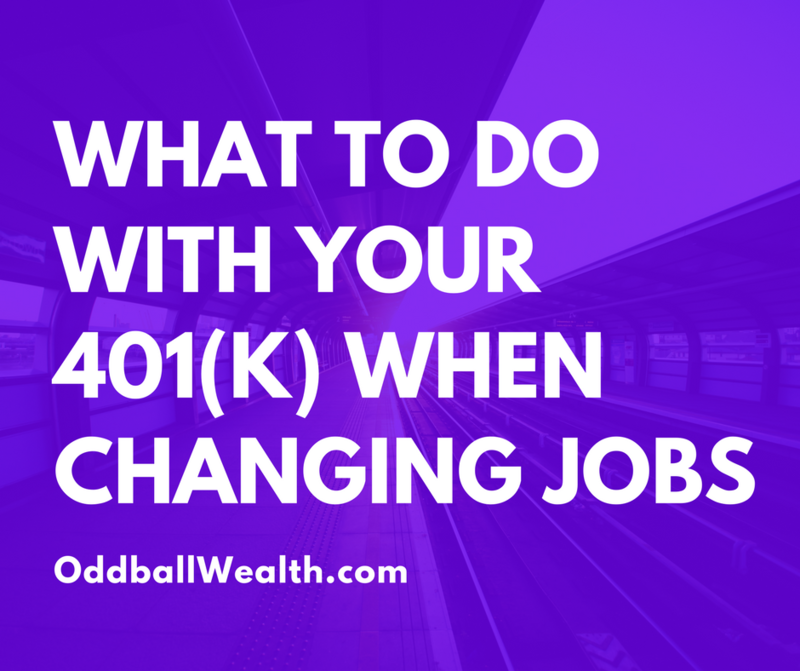 If your new job offers a 401(k) plan or a similar retirement plan, generally you’re able to move the money from your old 401(k) or the new retirement plan. To find out, read your new plans guidelines or talk to your human resource manager to determine whether or not you’re able to do a balance transfer and rollover the old 401(k) in the new retirement plan. 3. Do an IRA rollover. If you want, transfer the money from your old 401(k) into either an existing or new IRA account. “IRA” is short for Individual Retirement Account. Before opening a new IRA, you’ll need to decide whether to rollover the money into a traditional or Roth IRA. Be strategic about it. For example, if you have a traditional 401(k), you’ll want to avoid any tax loss and transfer the funds to a traditional IRA. The opposite is also true, if you have a Roth 401(k) you’ll want to roll the money over to a Roth IRA. If you’re considering doing an IRA rollover, read this great article called The Best IRA Accounts for Retirement and Long-Term Growth. It reviews and compares the best IRA’s available based on an individuals investing goals, financial goals, personal risk tolerance, and types of investments they want to hold. It offers a lot of great information and I highly recommend you read it before opening an IRA account or conducting an IRA rollover. You can read it here. 4. Do a 401(k) withdrawal. I normally wouldn’t recommend this option, but you can withdraw the funds from your old 401(k) when you leave a job. If you’re younger than 59 1/2, all the money you take out will be taxed as income. Plus, you’ll get hit with a 10 percent 401(k) penalty for early withdrawal. Additionally, unless you’re extremely self-disciplined, that money is no longer invested for retirement and it can be easy to just spurge and spend it. Of course cashing out or withdrawing the funds from your old 401(k) and taking a lump sum is always an option you have when leaving a job, it’s usually not the best idea. Whatever option you choose, be sure to stay disciplined. So when it comes time to retire, you’ll have built a nice portfolio of savings and retirement income. There is no right or wrong answer for which option you choose to do with the money. Every individuals personal situation and circumstances are unique and will differ from person to person. I believe any of the first three options above to be the best. It’s good to make an educated decision. Below are some things you’ll want to be aware of and consider before choosing. To say the financial industry is greedy would be an understatement. It’s an industry that markets itself as having the best interests and good intentions in mind for helping savors and investors like yourself. But, when you’re not looking they’ll nickel and dime you in fees as much as possible, retirement accounts and plans included. 401(k)s are especially exceptionable to many fees. When I worked as an financial advisor, I’d sit down with clients who wanted to rollover old 401(k)s into an IRA. Before doing so, I would ask to sit down with them to determine their financial goals and investing expectations for wanting to transfer the money. I also wanted to get a chance to review their current 401(k) plans and explain to them any fees which they were currently paying, or any they would incur by doing the rollover. Honestly speaking, one of the best reasons to do an IRA rollover is to avoid any fees associated with your old 401(k). With a 401(k) you have little control over the fees it charges, but you have full control when it comes to picking a low-cost IRA. One benefit with 401(k)s and other employer retirement plans is many times you’re able to invest in lower-cost funds, which you otherwise wouldn’t have access to on your own. Expense Ratios: Every index fund, ETF, and mutual fund charges a management fee called the expense ratio. It’s a regular ongoing fee you pay based on the percentage of the amount of money you have invested in a particular fund. Index funds generally charge a significantly smaller fee percentage than professionally managed mutual funds. If your employer’s plan doesn’t offer any low-expense ratio funds, then you may want to consider an IRA instead. Administration Fees: Many 401(k)s charged administration fees for so called things like managing investments, account maintenance, legal services, and other things. Some employers will cover the these fees on behalf of the employees. Read your retirement plans guidelines and description, or talk to your HR manager to find out what fees you pay. Other/Miscellaneous Fees: The financial industry can be very sneaky at times and there could be other random fees you may not know about. Another reason why it’s good to always be on the lookout. Once you’ve taken the time to think about your retirement plan and investment strategy which should align with your personal goals and desires, you’ll have a good understanding about which investment options are best suited for you. Ask yourself, which of the options from above best suits your investment strategy and will help you reach your retirement goals? If your 401(k) already offers these options to you, then it might be a good idea to just leave your money where it is. If it doesn’t, moving your money to an IRA may be the best route, which would give you full control over your investing options. Having multiple accounts makes managing your investments and everything else more difficult. It’s much simpler to manage only one or two investment accounts. This makes tracking your investments and goals much easier and more efficient. Asset protection and wealth preservation should also be a key factor in your decision. Money inside a 401(k) account can give you a peace of mind as it’s fully protected from lawsuits and bankruptcy. While IRA protection for your money is different in every state. To find out an IRA offers creditor and asset protection in your state visit IRA Financial Group webpage here and scroll down the chart until you find your state. This isn’t a big concern for the average person. Although, if any of the scenarios listed above relate to you, learn more about your state laws relating to IRA protection to help you make the best choice. Once you’ve taken the time to think about about everything mentioned above for deciding what to do with the money, below are some more things to consider, avoid, and be cautious about. Normally, you can keep any money in your old 401(k) for as long as you like. This gives you time for making your decision. In some situations however, your old plan might require you to make a decision within a certain amount of time. Otherwise it’ll automatically withdraw the money inside account and send it to you. In this type of situation, if they send the money to you, those funds will be fully taxed and you’ll get hit with a early withdrawal penalty assuming your under 59.5 years of age. To avoid losing money to taxes and penalties, be sure to check with your plan guidelines and determine if there are any time limitations associated with that account when leaving that job. If you want to do a 401(k) or IRA rollover, which is simply moving the money from your old retirement account into a new 401(k) or IRA – then you’ll want to do what’s called a “direct rollover.” A direct rollover is a tax-free cash distribution from one retirement plan that you contributed to and transferring those funds to another retirement plan. Your employer will hold 20 percent of the money for tax reasons. At the same time, in order to avoid taxes and other penalties you’ll still need to deposit the entire balance that your old 401(k) had into an IRA. For this to be possible, you’ll need to get money from another source or account to make up the difference. You have to deposit the money into an IRA within 60 days or you’ll get hit with a penalty and all the money will be considered taxable income. To avoid any complications and headaches, it’s much easier to just do a direct rollover. If your employer made any contributions to your 401(k), you’ll want to see if your company had a vesting schedule to be sure you’re entitled to all the contributions your employer deposited. This is strictly for any money your employer contributed. Any money you personally saved and contributed is yours no matter what. The worst thing to do is to not make a decision at all. Procrastination is contagious, and like one of Garth Brooks classic songs tells us “what we put off tell tomorrow will soon become today.” It really easy to put things off one day and then another, and so on. It’s best to make a decision as soon as possible and get it taken care of when you change jobs. Obviously, take the time to educate yourself and consider what’s best for your goals and family when making your decision. You’ll be more likely to make the best choice now while the thought is fresh in your brain. Waiting too long could cause you to forget about it or cause you to rush and make a last minute choice. Even though this is an important decision, try not to over complicate it. This money will someday be your source of income which allows you to no longer work and retire. This is also the money you’ve been saving to help reach your financial goals, so pick an option that protects it and allows it to grow!